Casa Silva is a family-owned Chilean company based in Colchagua with vineyards around the central and coastal Colchagua region. The Silva family has its origins in France, coming from a Bordeaux winemaking background and the company was established in Chile in the 1920s. They produced bulk wines for almost 70 years, but in the last couple of decades their beautiful winery and home estate in Angostura has been producing estate-bottled wines. I visited Casa Silva in 2010 and filed an extensive report. Since then I have continued to enjoy their extensive (and at times slightly confusing) range of wines. I have always found Casa Silva to produce good to very good wines. I’d say the wines are very ‘solid’ which is, I accept, slightly damning with faint praise. But it is not meant to be negative: Casa Silva’s wines are always well made, often extremely good to drink, and they are good expressions of their varieties and styles. Their top wines have garnered scores into the 90s from me, and even at the entry level they are, well, very solid. Perhaps this is just an example of how some people (though not me), would describe the entire country’s production. There is a school of thought that there is a ‘Chilean problem’ – if you can call it a problem – in their ability to produce technically excellent and good value wines, but wines that somehow just don’t set the pulse racing. With Casa Silva the wines can sometimes be a touch too high in alcohol, a touch lacking in light and shade. But again, that is not to deny the generally very high standards here. A number of Casa Silva wines were sent to me as samples over the past year. and I thought I might arrange a proper, methodical taste test to see if my gut feeling about the wines was borne out through tasting. My notes on twelve of Casa Silva’s wines follow. UK agents for Casa Silva is Jackson Nugent. See all stockists on wine-searcher. Note that the older vintages tasted here may not be in stock currently. From estate grown fruit in the Colchagua Valley, this is a 50/50 blend between the two varieties, with only 30% of the Chardonnay fermented and matured for three months in French oak. Pale green, it has a fairly low-key aroma, the soft mealy note of ground almond and a touch of apple emerging. On the palate the super-sweet fruit is juicy and fresh, with a hint of tropical fruit richness and more of that apple and pear, especially in the acidity. The oak adds a touch of nut and vanilla in the finish. 87/100. £8.00-£8.50, Averys, Frank Stainton, Arthur Rackham, Michael Jobling. From a small plot within the home estate, around 45% of the wine was fermented and aged six months in French oak barriques. Nuttiness and gentle brioche notes, an apple character to the fruit. Maybe just a glimpse of something more exotic, but fairly restrained. In the mouth masses of ripe fruit sweetness, a pineapple chunk character, with the toast of the oak growing in the finish. Big with its 14% alcohol and sweet-fruited, but balanced. 89/100. £10-£11, D. Byrne, Bayley & Sage, Ralph Needham. Not ostensibly different to the wine above. Is it perhaps a little less exotically fruited and a little more linear? Good, cool precision with a similar blend of rich fruit, toast and fresh acidity. 89/100. £11.95, D. Byrne, Bayley & Sage, Frank Stainton. A selection of the best grapes from Casa Silva’s estates, 30% of this Viognier cuvée is fermented and matured in French oak for four month, the rest is in stainless steel tank. Pale, youthful colour and an attractive nose, with just a hint of creamy almond and of green herbs, with apricot fruit beneath. In the mouth this has lovely flavour, touching on lychee and mango, fresh and juicy pear and a kick of grapefruit into the finish. The oak adds a touch of warmth, as does the 14% alcohol, but the balance and length is very good. 89/100. £10-£11, Averys, Bablake, Caviste, Inverarity121. From Lolol, a cool, Pacific-influenced area of coastal Colchagua, a higher proportion (55%) is again fermented and matured in French oak, this time for six months. The cream and cashew of the oak dominates the nose, but the signature apricot and peach of the variety comes through very nicely, with little nuances of nuts and of spices. On the palate it is full and powerful, with 14.5% alcohol and plenty of ripe, rich concentration. The sweetness of fruit meets some alcoholic heat just in the finish. I guess whether you prefer this to the Reserva above depends on your liking/tolerance for the bigger style of Viognier, but I’d certainly drink more of the Reserva. 88/100. £11.95, Averys, Frank Stainton, Harrods, Inverarity121. A blend of Sauvignon Blanc, Chardonnay, Viognier and Sauvignon Gris, 40% of which was fermented in oak, then the different components matured in French oak or steel for varying times before blending. Attractive and unusual nose, the passionfruit and guava richness is there, a really exotic lychee-like lift, but then so is smoky, nutty fruit and oak and a sense of cool green herbs. On the palate this is brimming with lively fruit, the sweetly tropical punch of ripeness, that nicely tart streak of green, and a vanilla and creamy hazelnut underpinning. The acidity is good and though the 14.5% abv is really well handled in the mix, a slight trace of heat suggest this would be even more to my taste if it could be notched back just a touch. 90-91/100. £15.00, Harrods, Barrels & Bottles, Frank Stainton. Dark and vibrant colour, A little more green and vegetal on the nose than the 2011 ‘Cuvée Colchagua’ for sure, just slightly reduced. Decent fruit, a bit green and grainy, with some supporting creamy oak and a fairly nice overall balance. A savoury wine, leaner and needing food more than the fresher 2011. 86-87/100. £8.50-£9.50, Averys, Barrels & Bottles, D. Byrne, Arthur Rackham. Colchagua-sourced Carmenère, 40% of which was matured for six months in French oak. It has an explosively bright crimson/purple colour and plenty of red liquorice and kirsch lift, floral and tight charcoal notes too. In the mouth it is fruity and chocolaty, an expansive core of ripe berries and black plum nicely supported by the oak, and a bit of rustic grip and alcohol (14%) combining to leave the finish robust, spicy and moreish. 89/100. £10-£11, Averys, Naked Grape, Luvians, Barrels & Bottles, D. Byrne, Arthur Rackham. This is a deep, dense and strapping style of Syrah, the nose thick with leather, plum and spices, not a lot of light and shade, but plenty of muscle. On the palate there’s something a little disjointed about this: there is that ripe and grippy plummy fruit, but also a fairly astringent aspect from very firm tannins and a slightly tart acid, that feels unnatural. The spices and the lick of chocolate are there, and it has that brawn and muscle, but it just doesn’t hang together in an altogether appealing way. 85-86/100. £10.00-£11.00, Averys, D. Byrne, Wine Rack, Inverarity121. This premium wine, hand-picked from selected vineyards is for the first time dominated by Cabernet Sauvignon (50%) along with 30% Carmenère, 10% Petit Verdot and 10% Shiraz, aged in French oak for 12 months. It has a bold, dark crimson colour a inviting, fairly high-toned nose of wild sage-like notes against really intense cassis. There’s plenty of oak here, and a certain leafy quality adding to that lifted aromatic. On the palate it is very fine, a dry, inky black fruit, but very polished as are the tannins, the acidity feeling quite natural and the 14.5% alcohol again just a touch prominent along with the spicy, smoky oak. But the components here seem really good and there’s a definite impression that this is coming together nicely. 90/100. £15.00, Harrods, Barrels & Bottles, Frank Stainton. 55% Carmenère, 30% Cabernet Sauvignon, 15% Syrah, 10% Petit Verdot, this too spent a year in French oak barrels. Perhaps it’s the extra year in bottle that has mellowed this a little, but there’s a nicely developed character, a touch of over-ripeness to the fruit character too, with sweet vanilla and violet joining plum and Agen prune. A substantial, creamy wine on the palate, the sheen of oak is nicely integrated in the picture, the cassis and ripe cherry fruit is full and sweet, and this finishes with good length. It could still do with a little time for the tannins to fully knit, but is very good indeed. 90-91/100. £15.00, Barrels & Bottles, Frank Stainton, Arthur Rackham. (Tasted 2010 but included for reference) 45% Carmenère, 27% Syrah, 23% Cabernet Sauvignon, 5% Petit Verdot. Lovely smoky and earthy nose, lots of wild garrigue notes and a certain creaminess. Lovely Bordeaux-like balance, with black fruit, a touch of olive and a fine spiciness. Lovely style. 91/100. 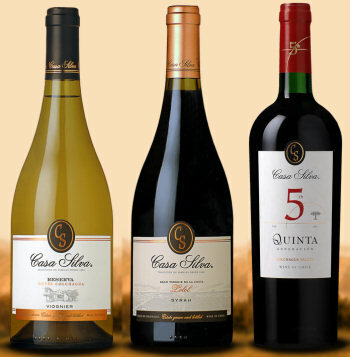 See all stockists of Casa Silva on wine-searcher.